Thank you the great work on these tools. It has made our network site so manageable. I'm having an issue withe the "Premium Plugins" module not hiding plugins on creation of a new sub-site. A new site is created and assigned a "basic" level that hides the premium plugins. But, all plugins are activated and not hidden. IF, I go to the "Pro Sites Management" settings page for the new site and manually set the site to a higher level, save, and then re-set it to a lower level, save, the plugins are hidden as they should be. But, it is not happening automatically. I've read through other posts, and I've made sure my premium plugins are not network activated. What else do i need to fix to make this work on site creation? When checking the new sub site are you doing it while completely logged out of the network admin? When logging into sub sites logged in as network admin or through the network dashboard logged in as network admin you will see many different options and listing of items that the end user cannot see. Can you please try if you have not already, logging in as the end user to see if you are still noticing the plugins that you are referring to? Note: you cannot have the network admin admin open in the same browser in a different tab or window because WordPress will detect that you are logged in. 6. All plugins are viable, including the ones that should be hidden. I'm having the same problem with the pro site plugin, mgyura. Are you using the most recent version of buddypress (1.5.4)? The Pro Site plugin says it works "perfectly" with buddypress 1.5.2, so I'm wondering if that is the problem we're having. Are you using 1.5.2? Just to clear up, no access plugins should not show to site admins, but if you view as a super admin all will be available. If you've checked that, the most likely guess is that you are using the new blog templates plugin which is pulling in activated plugins from your template. You are correct, the issue is that the Admins and Super Admins see the same plugins on site creation. I am not using the "New Blog Templates" plugin. I am not using BuddyPress, and I have the most recent version of all plugins, themes and WP. Hope this helps. And are these plugin set to no access activated on a new site? They are set to activate on different levels. There is a drop-down menu where I select the level they should activate on. The plugins are hidden correctly when I manually change that subscription level, so it is working. Just not when the site is created. When the site is created what level is it on? And note they won't ever be hidden, it will just show an upgrade instead of activate link next to each. The basic most level. I think we call it "basic"
That's good news about the upgrade link. The more areas to upgrade, the better. The issue still is the same as before. We have not found a solution. I'm sorry, I havn't been able to reproduce your issue. 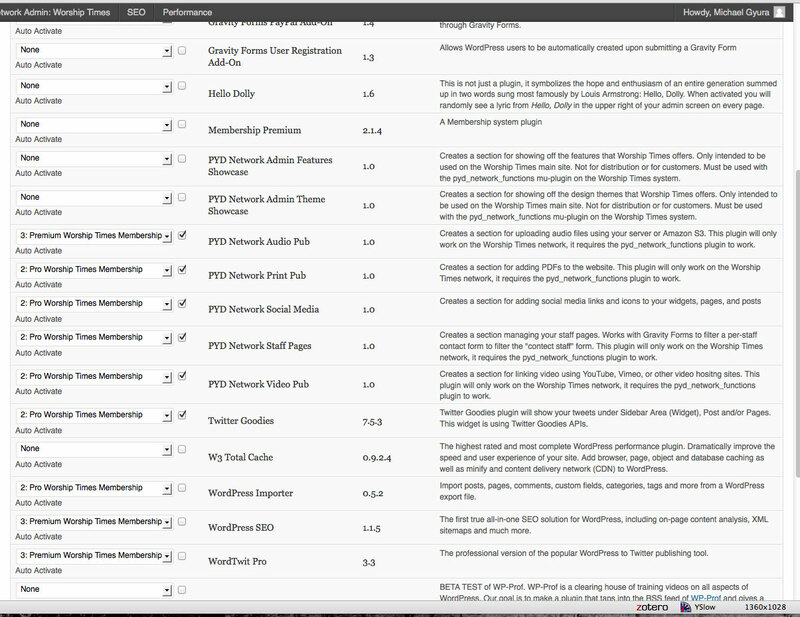 Can you give me a screenshot of your premium plugins settings screen, and the plugins page of a newly created site without pro priveledges while logged in as blog admin, as well as the "Plugin Override Options" section at the bottom of the wp-admin/network/site-settings.php?id=# tab for the site in question. Thank you for the followup. Sorry, i missed the last communication. I made the screen shots requested, and I also made a short screen capture video. I thought it would help by showing you what is happening. The second is the dashboard of a newly created blog. We cant view the plugins page because a sub-site admin doesn't have access to that. The third is a shot of the plugin override section on the network admin for the newly created sub-site. Here is the link to Vimeo for the screen capture video. Please let me know if you need anything else. Thank you for your help. I've tested this thoughroughly recreating your steps, with no issues. It's definitely not a pro sites bug. My best guess is that you are using blog templates plugin and your template blog has those plugins activated, so they are being carried over to new sites. I'm refering to our new blog templates plugin, which from your screencast it appeared to be installed. A sure fire way to check is to create a blOg with the premium plugins module off. It could be another plugin as well. and it looks great, but we don't have that one installed. Following your advice, which is good, I deactivated the "Premium Plugins" module and created a new sub-site. Sure enough, the plugins did not activate. So, the new site correctly activated only the plugins they were supposed to with "Premium Plugins" deactivated. There is some conflict happening with the setup I have and the way this plugin works. Do you have and dev docs or notes on this plugin, or do i need to just read the code to figure out how it works? You are welcome to go through the premium-plugins.php module code, it's decently commented, and not really too complex. Like i've said I've done the same thing debugging myself though and all worked as it should. I have the same issue as mgyura. Ok. So I did a fresh install of a wordpress multisite. (3.3.1). The same problem persisted. First I installed Pro Sites plugin and network activated it. Then I installed e-newsletter plugin and set it only available to level 1 users (did not network activate it). Then I created a new user and a new site associated with the new user through the superadmin network dashboard. I then logged out of superadmin and logged in to the newly created user's site. I see e-newsletter plugin available for use by the newly created 'free' user. All settings are default. No other plugins or themes are installed. Anyone else facing similar issues? Or am I using it wrongly? Most likely you have a free trial set. Or you are using New Blog Templates and your template site has the plugin activated. Thanks for the response. It's just not working. It's a fresh copy of wordpress 3.3.1. No additional plugins or themes installed. Just pro sites plugin and e-newsletter plugin. E-newsletter being the premium plugin only available to level 1 users/sites but it appears available for the free user. How did it go with yours? Are you saying as a free user on a free blog you are able to activate? Free user and site was registered through front-end registration at mydomain.com/wp-signup.php. So when you visit the plugins menu for that site, it shows as activated? And when you visit pro sites > manage that site shows as not level 1 or above? If you revoke pro site status there, does that deactivate the plugin?